Source: Food and Agricultural Organization of the United Nations (FAO), 2016. Avocados are more than for guacamole now, as they are the breakfast choice of health enthusiasts and a typical part of many North American diets. Per capita fresh avocado consumption has risen exponentially in the last decade, with Hispanic household purchases averaging $33.45 or 120 avocados per year, and non-Hispanic households purchasing an average of 76 avocados or spending about $22.69 per year. Before the North American Free Trade Association, during the 1980s and 1990s, the California Avocado Commission championed the use of avocados for guacamole dip during the Super Bowl and Cinco de Mayo, capturing the interest of supermarkets, bars, and restaurants during the California avocado harvesting season. Later, in 2003, the Hass Avocado Board was created to manage promotion of the rising supply of avocados entering the United States from Mexico to create year-round supply. Today, the Hass Avocado Board distributes 85 percent of its funds to various promotional associations including the California Avocado Commission, the Peruvian Avocado Commission, the Chilean Avocado Importers Association, and the Mexican Hass Avocado Importers Association. For many years, since 1914, the United States had banned imported avocados over fears of insect infestations and competition. But in 1994, Mexico, Canada, and the United States enacted NAFTA and soon thereafter the United States lifted its ban. Later, additional negotiations allowed avocado shipments from Peru, Chile, the Dominican Republic, and other countries to be shipped into the United States. 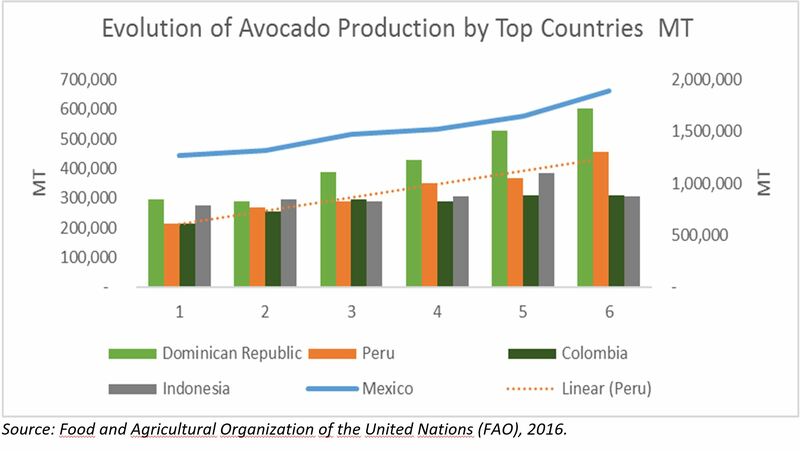 As a worldwide phenomenon, global avocado production has increased from just under 4.4 million metric tons in 2011 to 5.7 million metric tons in 2016. The world’s top 5 producers from 2016 include Mexico (with 33 percent of global production), followed by the Dominican Republic with 11 percent, Peru at 8 percent, and Indonesia and Colombia with 5 percent each. Of all the avocados produced in the world, 77 percent are consumed locally, with 33 percent exported. Mexico consumed over half of its production (51 percent) in 2016, while the Dominican Republic consumed 98 percent, Peru consumed 57 percent, Colombia 94 percent, and Indonesia 100 percent of its total production. Monica Gallo Riofrio earned an MBA from INCAE in Costa Rica and previously served as a price analyst. She is an agribusiness consultant and contributes her expertise to executive education programs.